Patient satisfaction has become an important consideration in healthcare, and providers have responded with a number of clinical initiatives, some at considerable cost. 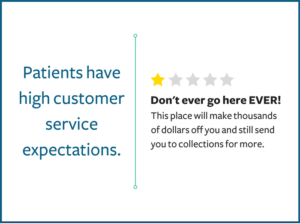 Yet, according to many online reviews, and in light of rising non-payment rates across the industry, today’s patients still aren’t satisfied. So why aren’t these initiatives enough? It’s because today’s patient is accustomed to digital consumerism. Giants like Amazon have raised the bar for customer service to lofty heights. Consumers can have whatever they want, whenever they want. They can check the status of their purchases with ease, and talk to customer service representatives through live chat, email, text or phone at their convenience. 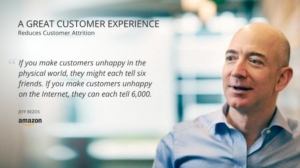 Consumers also have the power to tell the world about their experience. And if it’s negative, they are 52% more likely to leave a critical online review , which could be read and believed by thousands. With rising deductibles and copayments, your patients are likely paying much more for your services than they are for their online purchases, yet the customer service they receive from healthcare providers is significantly inferior. When ordering from Amazon, consumers can see exactly what they’re buying down to precise product specifications. But with healthcare, patients often receive charges that are not only different from initial estimates, but are also split into multiple bills that arrive at different times. It may be months after service before a patient can even manually calculate their total financial responsibility. If an Amazon customer is confused about a product they received, they can visit Amazon at any time of day or night and find vendor resources, user reviews and comprehensive answers to product questions—even for very inexpensive items. Patients often have to work very hard—calling multiple times, trying to connect with the right insurance representatives, or unsuccessfully searching bare-bones patient portals—to better understand thousands of dollars worth of charges. Shoppers on Amazon can access customer service representatives through email, phone, chat and other channels, and can also manage their entire account—from payments to addresses to returns—all on their own. Patients on the other hand have few options beyond calling representatives during inconvenient working hours and mailing checks with physical bills. If a patient can’t pay their bill in full, they usually need to call the Contact Center to see if the hospital offers a payment plan. While providers have little control over patients’ out-of-pocket costs, they are able to offer their patients every customer service perk that Amazon provides. Amazon and many other consumer powerhouses use customer service platforms to provide the price transparency, fast resolutions, and convenient account access options outlined above. 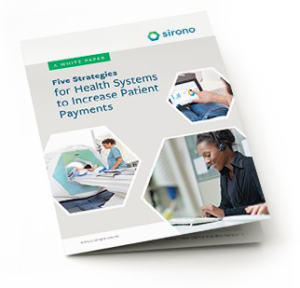 That’s why we created Sirono—to offer the world’s best customer service platform to healthcare organizations. In fact, Sirono is built on the Salesforce framework, the same customer service platform that Amazon uses for its operations. Contact us to learn how you can have the best customer service tools, too.